Despite North Korea’s promise to denuclearize and public image makeover, Jo Sun-keun, 23, who has grown up under threat from North Korea’s occasional nuclear and missile tests, does not think the North will dismantle its nuclear arsenal completely. In his memory, North Korea has never stopped pursuing nuclear ambition, and used threats and fiery rhetoric toward its southern neighbor. It made conciliatory gestures only when it needed help from the South, and broke its own promises. Jo is just one of many young South Koreans skeptical toward North Korea, if not indifferent, despite a recent thaw in inter-Korean relations and ongoing denuclearization talks with the communist state. After a year of tensions heightened by North Korea’s nuclear and missile tests, North Korean leader Kim Jong-un returned to the negotiating table earlier this year and committed to the complete denuclearization of the Korean Peninsula at his summit with US President Donald Trump in Singapore in June. A survey of 1,000 people conducted from Friday to Sunday by The Korea Herald in collaboration with research firm JoWon Communication Innovation showed those aged between 19 and 29 -- the youngest group in the survey – are most skeptical about North Korea. About 79 percent of the respondents aged between 19 and 29 said that North Korea is unlikely to completely denuclearize. Some 36 percent said that North Korea would renege on its promises -- the greatest among all age groups. 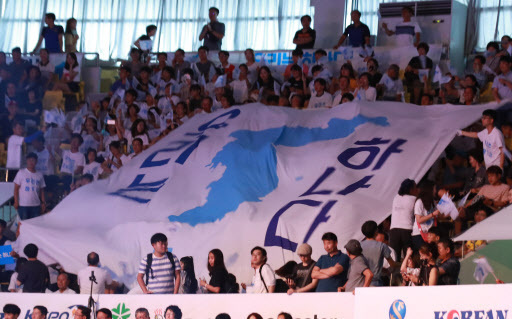 The majority of the young, or 57.5 percent, supported President Moon Jae-in’s North Korea policy, which focuses on leading the North to denuclearize through engagement and improving inter-Korean ties, followed by those who don’t support his policy (22.1 percent) and those who think some adjustments are necessary (17.4 percent). Asked about the appropriate timing of unification of the two Koreas, 24.9 percent said unification would never take place. Some 14.7 percent of those in their 30s, 11 percent of those in their 40s, 12.4 percent of those in their 50s and 12.2 percent of those in their 60s or over also said there would be no reunification. Jo, who just finished his mandatory military service, said he does not think South Korea must reunite with North Korea. Many of the older generation, who experienced the 1950-53 Korean War directly and indirectly, tend to perceive reunification as necessary on grounds that people of the two countries should overcome the unfortunate legacy of the war and are one people from one nation. “Women in their 20s and 30s tend to be indifferent to reunification with North Korea, while men of the age group have a strong tendency to view North Korea as an enemy,” said Kim Ji-yoon, a research fellow at the Asan Institute for Policy Studies. The skepticism was apparent in the PyeongChang Winter Olympics, when the two Koreas agreed to field a joint ice hockey team. The move faced an unexpected opposition from young South Koreans who found it unfair to cede South Korean players’ positions to North Koreans. But the perception of North Korea among younger generations could change, depending on South Korea’s relations with North Korea, she said. “If inter-Korean relations get better and those who are in their teens now grow up witnessing it, they could perceive North Korea more positively,” she said.